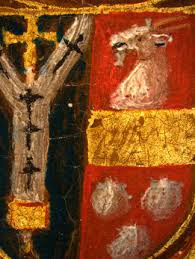 Heraldry: The Arms of an Archbishop? Not surprisingly, there are ecclesiastical arms in the church of St. Mary-at-Lambeth, which sits just outside the gate of Lambeth Palace, the home of the Archbishops of Canterbury in London. Here, held by an angel which is also one of the supports for a roof beam, are the impaled arms of the Archbishop of Canterbury and (I believe) Archbishop William Warham (Archbishop of Canterbury from 1503 until his death in 1532. I say "I believe" because the depiction of the arms here in the church is a little confusing. 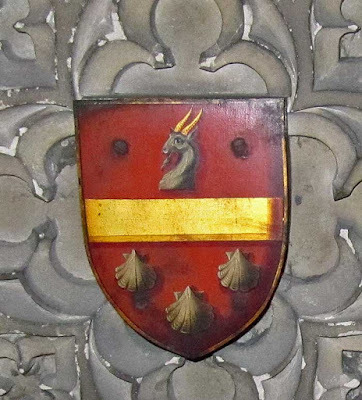 Burke's General Armory blazons Archbishop Warham's arms as: Gules a fess or between in chief a goat's head erased argent horned or and in base three escallops two and one argent. The carving here has the "fess" reduced in size to basically fimbriation of a chief, and the escallops have become the main charges on the shield, with the goat's head on a red chief. Alas, poor Warham! He was Archbishop of Canterbury during the time when King Henry VIII was trying to annul his marriage with Catherine of Aragon and move Anne Boleyn into Catherine's rooms at the palace, and so he would have to have been somewhat involved in all that fooforah. (Fooforah: a technical term used by historians to mean "a complete and total mess.") Fortunately for him, he was not in the direct line of fire the way that Lord Chancellor Cardinal Wolsey was, and he died comparatively peacefully still in office in 1532.